You probably already have something like this posted to your office/cubicle, right? 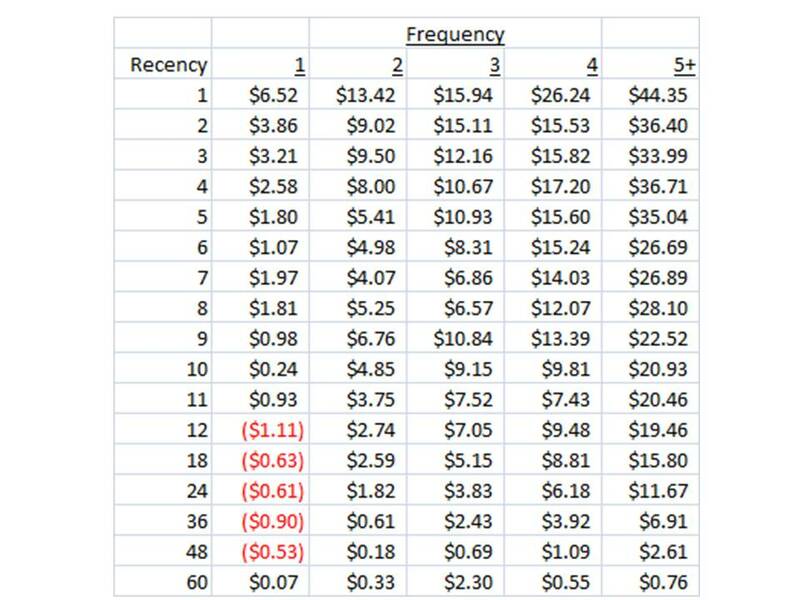 The "Value Grid" is a table that illustrates how much twelve-month profit you will generate from a customer with various Recency/Frequency attributes. Freeze your file as of August 22, 2010. Segment customers into Recency/Frequency combinations. Then measure customer profitability across these segments, from August 23, 2010 to August 22, 2011. Your benchmark is the Recency = 1 / Frequency = 1 segment. This is how much profit you generate in the next year by acquiring a new customer. 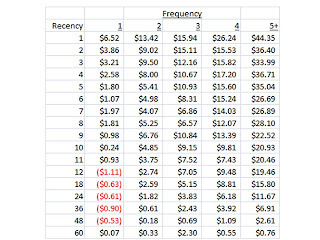 If you lose $22.00 profit acquiring a customer, then you've got problems, because in this table, the customer pays back $6.52 in the next year. Oh boy! Similarly, you explore the cost to reactivate a customer against future payback. If you have a 36 month 3x buyer with $2.43 future value, you might be willing to spend a few extra dollars to convert the customer to a 4x buyer. Then look at the customers who pay the bills! In this case, customers who purchased recently and purchased five or more times generate a boatload of profit, don't they? Create a Value Grid. Post it on the wall of your office/cubicle.